December, 1961. My first Christmas. My parents wanted to send out a "photo card" to all their friends and relatives with their new bundle of joy figuring prominently. 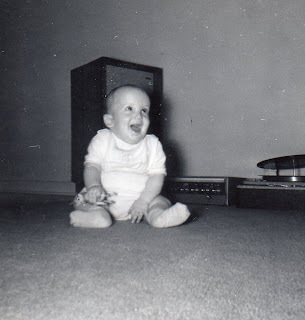 But there was a hitch: the best my dad could coax out of me was a sort of wry smile....until he hit upon the brilliant idea of plopping me on the carpet in front of his Heathkit (with Wharfedale speakers) and putting some tunes on. Like magic: I start grinning and babbling like a little maniac, resulting in the incredibly minimalistic picture you see here. Frozen in that moment in time, the expression of unbridled joy on my face makes it impossible to overstate the impact music was to have on my life from my very first years. It's the passion that drives me, it's my life's blood and it's never too far away at any given moment. This week a friend asked me to take part in a survey he was doing on his blog; he wanted people to list their 10 favourite songs of all time. Now, I have owned (and, for the most part, still own) literally thousands of albums in my life on vinyl, CD or cassette. I have a few hundred 45 RPM singles in my collection, too. Add to that the many songs I have purchased on iTunes or...ahem...not purchased through other electronic methods and I think you see my dilemma. It's a lot like asking someone to name the favourite of all of his or her children, or the best 10 breaths he or she has ever drawn. But I promised I would give it a try and it took up a good chunk of my evening last night. Because I spent so much time on it - and because I honestly have nothing else to write about today that doesn't revolve around the Ford brothers (yeesh) - I figured I would make the work do "double duty" and post my choices here on my blog as well. First of all, some disclaimers: I knew that if I left this compilation open to all genres then it would be impossible to ever finish the project. It's hard enough to compare Pop/Rock songs to each other (which is what I did); I can't even imagine having to then compare (spoiler alert!) Elton John to Billie Holiday, for example. Besides, now I have a blog idea for another day: my top 10 Jazz favourites of all time. See? Always thinking ahead. Also, I decided on an arbitrary "rule": once I had chosen any song by a particular artist or group to be in my top 10, then that would eliminate that performer from any further consideration for the rest of the list. In the end, this actually impacted one of the positions; to say which one would be telling. I will post these in reverse order - from #10 to #1 - and I welcome your comments on my choices; moreover, however, I welcome your own personal lists, whether they be top 10, top 20, top 5, whatever you desire, I'd love to see them. I have owned their "Best of Friends" Greatest Hits album in several formats and I go back to it over and over again in times of stress. This is one song of theirs I used to sing to my kids; House at Pooh Corner is another. It was tough to choose. As is the norm with Harry's songs, the studio version absolutely does not do this justice. I was lucky enough to see him live on several occasions (and held tickets for an upcoming show when he tragically died) and this was always one of my favourites. But it was his performance of this on the Tonight Show in 1978 that I will never forget. Even Johnny Carson was in tears when he was done. I used to sing this, of course, to my daughter. For a short time in 1980 I lived with my good friend Stephe Yorke in his room on the third floor of his folks' home in Riverdale. Though the circumstances of how I came to live there are not pleasant, the experience itself was. Stephe was a couple of years older than me and had several older siblings that introduced him to some amazing music, which he was only too happy to share with me. He played this nearly every morning as we started our day. This song might have made this list on its own merit; however, in the early '90s my friend Richard Weait and I were nuts about a band from Newfoundland that had moved to Toronto, Thomas Trio and the Red Albino. We got to know this group so well that we even were invited to their Christmas party in 1992 (where I had my first taste of "real" screech). They did an incredible cover of this song and Richard and I would regularly get them to play it as an encore at their shows. This is still a better version, but it's close. What can I say about this one? This might very well be the funkiest song in the history of music. I didn't know Stevie's music very well when I first heard this song; suffice it to say that changed in the blink of an eye. When I wasn't waking up to A Routine Day, I was waking up to this song. Another performer I only vaguely knew of when I was 18 but whom I absolutely adore now. This entire album could have been on my list (in fact, I nearly chose Into the Mystic instead); if I made a "Desert Island List" of albums, this would be in one of the top 3 spots. I have loved this song since the first moment I heard it. I always sing along and when I do, I try to sing just like Janis. Seriously. I can't imagine singing this any other way. I love the slow build and then the explosion leading to the instrumental work late. Just an incredible piece of music, written by Kris Kristofferson. One of my friends - I believe it was the very same Stephe Yorke - once described this as the "greatest pop song ever to be written". I simply cannot dispute that opinion; everything about this tune and recording is, to me, absolutely seamless. I didn't know this song when the Madman Across the Water album came out in 1971 and I didn't hear anything other than Tiny Dancer from that record for many years. But once I heard Levon for the first time I fell in love with it. I used to play this in the auditorium at Innis College in Toronto while a group of people sang along with it. Those were the days, let me tell you. So, that's my list. Well, it might be more accurate to say that's my Top 10 All-Time Favourite Pop/Rock songs as compiled on May 9, 2012, because there's no question in my mind that the time of day, the time of year and the time of my life has informed this list considerably. I can't imagine the top 4 or 5 songs moving at all; however, the bottom 5 were all close calls. Here, for interest's sake, are the 11 through 15 songs, which just missed the cut: All Uncovered - The Watchmen; Pressure Drop - Toots and the Maytalls; Still the Night - BoDeans; Wheat Kings - The Tragically Hip; I Still Haven't Found What I'm Looking For - U2 (live version from the Rattle & Hum album). Ok. Have at it! Let's see how your lists might look! BTW, here is the original post that I answered with my 10 songs. Please check it out and while you're there, why not visit the rest of the site for which Jason (first commenter here) is such a big contributor? Thanks! Excellent. A little "quid pro quo"! Thanks, Jason! Not to mention a great list. I don't think I said that on either blog yet. :( Sorry! It's hard for me to believe the Eagles didn't appear on mine anywhere. For sure they'd be in the top 30, although I'd be hard-pressed to pick just one song. Same goes for Queen. I couldn't put these in any particular order because as you said Penguin, the order could change in 5 days or it may be as little as 5 minutes. Excellent list as well. Love that Cash cover, just love it. Reading your list and Jason's over again it occurs to me that somewhere along the way "I've Just Seen A Face" mysteriously disappeared between my written list and what made it to the blogs. I have no idea how that happened; it should probably have been top 15 at least. But then...I'm sure I forgot others, too. I must say I'm very pleased by the number of Harry Chapin choices both here and on Jason's site. Did you ever get to see him live? He and his band put on the best show around back in the day. Saw him once and never missed him again - five times in total. Thanks for your list! Unfortunately I never got to see Chapin live. As a matter of fact, the last live concert I saw was probably Triumph, in a High School auditorium just before I left Toronto permanently in 1977. Hopefully someone who reads this is familiar with them. God I'm old. Wow! That was before any of their albums went gold - in fact, I think they only had the one album at that point. Which high school? I really liked Triumph in their heyday. Rik Emmett is an incredible guitar player across many different genres and, as far as I know, is still quite active as a producer and performer. He did a nice turn on the CBC documentary series about the Canadian Music Industry that aired last year and the year before. I was afraid you were going to ask which high school. Unfortunately I couldn't give you a name if my life depended on it. I wasn't a student there but merely an invited guest. I remember Triumph did a cover of Zepplin's "Whole Lotta Love" which to this day I think was better than the original. I am pretty sure they played at my friends' high school, Sir John A MacDonald, around that time....but I could be wrong. I know they had Rush there, too. That school was on Pharmacy, north of Sheppard. Ring any bells? I think you lived down here in East York, right? No this was down Agincourt way, somewhere on Kingston Rd. Maybe between Eglinton and Lawrence? I do have to add Maybe Im Amazed - Paul McCartney to that list somewhere. And I love James Durbins version of it !!! And yet, I own two of their albums. Huh. Go figure! No, I have the obvious one - "Metallica" - then I went back and bought "...And Justice For All". That's where the collection ends! Tea for the Tillerman was one of the best albums I've ever owned. Cat just barely missed the cut, too. It might be because there were just too many songs to choose from! Well, I certainly can't say that mine are in "mint condition" (although some likely are). I played the hell out of them. :) I have around 1,000 vinyl albums, but not sure of the exact count. And the CDs are another story altogether. I really should digitize them all....but I don't have the patience.